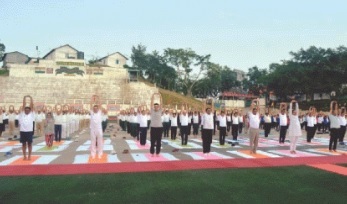 Even as the whole nation was celebrating International Yoga Day on Thursday, the Christian dominated north-eastern state of Mizoram decided to give the event a miss with no official function held to mark the occasion. While State Chief Minister Lal Thanhawla was busy with his grandson’s marriage, other Cabinet ministers were also ‘preoccupied’ with their works. Though the day was observed by the Assam Rifles and the BSF, no ministers or government officials were present in the events. Yoga has always been a controversial issue in Mizoram with churches as well as several NGOs, including the largest civil body Young Mizo Association (YMA), opposing it from the very beginning on the ground that it is a part of Hindu philosophy and does not comply with Christian belief. They are of the opinion that yoga practice is ‘anti-Christian’ and doing it can dilute Christian belief. Some even say that through observing Yoga Day, the Sangh parivaar is trying to impose Hindu beliefs and philosophy on the Christian dominated states like Mizoram. Several political parties including the Mizo National Front (MNF) has also opposed introduction of yoga in schools and in the state police department. It may be recalled that last year, the YMA had warned the people of Mizoram on practicing yoga as a form of exercise. People’s Representation for Identity and Status of Mizoram (PRISM) in a statement issued on Thursday said that it strongly opposed yoga as there is no necessity to be practiced in a state like Mizoram. PRISM, the newly floated political party which was earlier an anti-corruption watchdog, said that no institution or individual should be forced to practice yoga.